Free crocheted doily patterns make beautiful crochet gifts. Here is an all-time favorite the ruffle doily patterns that look like crochet lace. This one measures about 21 inches from point to point, if made with size 30, white or ecru, Clark's Big Ball Mercerized Crochet and size 10 steel crochet hook. This is not really one of the doily patterns a beginner should start out with. But neither is it very difficult so that an intermediate crocheter should be able to do this with ease. Starting at center, ch 4, join with sl st to form ring. Rnd 1: Ch 1, 8 sc in ring, join with si st to first sc. Rnd 2: Ch 6, de in same place as si st (starting V st made), (ch 1, in next sc make dc, ch 3 and dc—another V st made) 7 times, ch 1, join to third ch of ch 6. Rnd 3: S1 st in next 2 ch, ch 4, in same V st sp make 2 de and hdc, (sc in next ch 1 sp, in next V st sp make hdc, 2 dc, tr, 2 de and hdc, 2 dc, tr, 2 dc, and hdc) 7 times, sc in next ch. 1 sp, make hdc and 2 dc in same sp as first 3 sts were made, join to top of eh 4. Rnd 4: Make a starting V st in same place as sl st, ch 1, dc in next dc, (ch 1, holding back on hook last 1p of each dc, dc in next dc, sk next hdc, dc in next sc, sk next hdc, dc in next dc, thread over and draw through all 1ps on hook -3 dc joint st over 5 sts made-ch 1, dc in next dc, ch 1, V st in next tr, ch 1, dc in next dc) 7 times, ch 1, 3 dc joint st as before, ch 1, dc in next dc, ch 1, join to V st as before. Rnd 5: S1 st in next 2 ch, ch 3, 3 dc in same sp, * dc and hdc in next sp, holding back on hook last 1p of next 2 sc make sc in next 2 ch 1 sps, thread over and draw through all 1ps on hook-joint sc made, hdc and dc in next sp, 7 dc in next sp, repeat from * around, ending with hdc and dc in last ch 1 sp, 3 dc in same sp as first 3 dc were made, join. Rnd 6: Make starting V st in same place as sl st, * (ch 1, de in next dc) 3 times, ch 1, 3 dc joint st over next 5 sts as before (base of point), (ch 1, dc in next dc) 3 times, ch 1, V st in next dc (tip of point), re-peat from * around, ending with ch 1, join. Rnd 7: S1 st in next 2 ch, ch 3, 2 dc in same sp, * 2 dc in each sp to within 2 sps before the joint st, dc and hdc in next sp, joint sc over next 2 sps, hdc and dc in next sp, 2 dc in each sp to within V st sp at tip of next point, 5 dc in next sp, repeat from * around, ending with 2 dc in same sp as first 2 dc were made, join. Rnd 8: Make starting V st, * (ch 1, dc in next dc) 5 times, ch 1, sk next dc, 3 dc joint st over next 5 sts, ch 1, sk next dc, (dc in next dc, ch 1) 5 times, V st in next dc, repeat from * around, join. Rnd 9: Work as for rnd 7, making 7 de in V st at tip of each point. Rnd 10: Make starting V st, 1 and dc in same place as sl st, * (ch 1, sk next dc, de in next dc) 5 times, ch 1, sk next dc, 3 dc joint st over next 5 sts, (ch 1, sk next dc, dc in next dc) 5 times, ch 1, sk next dc, in next dc make dc, ch 1, V st, ch 1 and dc, repeat from * around, ending with dc, ch 1 in same place as first V st was made, join. Rnds 11 through 19: Repeat rnds 9 and 10 alternately, having 1 sp more between the joint dc and tip of each point on all even rnds. Rnd 20: Make starting V st, 1 and de in same place as sl st, * (ch 1, sk next dc, dc in next dc) 11 times, ch 1,. 3 dc joint st over next 3 sts, ch 1, (dc in next dc, ch 1, sk next dc) 11 times, in next dc make dc, ch 1, V st, ch 1 and dc, repeat from * around, ending as before, join. Rnds 21 through 29: Repeat rnds 11 and 20 alternately, having 2 sps more between the joint dc and tip of each point on all even rnds. Ruffle-Rnd 1: Ch 8, de in same place as sl st, * ch 5, sk next st, dc in next st, repeat from * around, making a ch 5 V st in center dc at tip of each point and ending with ch 2, dc in third ch of ch 8. Rnd 2: Ch 8, * dc in next 1p, ch 5, repeat from * around, making V st in V st sp at each point and ending as before, join. Rnds 3, 4: Ch 9, * dc in next 1p, ch 6, repeat from * around, ending with ch 3, dc in third ch of ch 9. Rnds 5, 6, 7: Work as for red 3 (starting with ch 10), making ch 7 1ps and ending with ch 3, tr in third ch of ch. 10. Rnds 8, 9, 10: Work as for red 3 (starting with ch 11) , making ch 8 1ps and ending with ch 4, tr in third ch of ch 11, join and fasten off at end of red 10. Starch lightly and press. 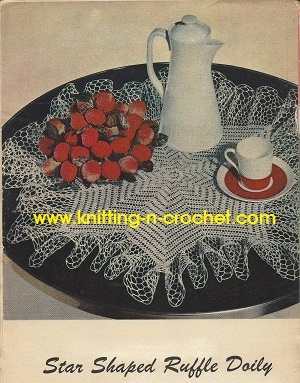 Please look around the site and you will find more free crocheted doily patterns for your enjoyment.